Now in its second year, the Fruit + Vegetable 40 Under 40 Awards will honor 40 outstanding individuals making their marks in the industry. Nominations are encouraged from all segments of the industry – men and women who are demonstrating involvement, innovation and commitment. The 40 young professionals chosen will represent the best in the industry. 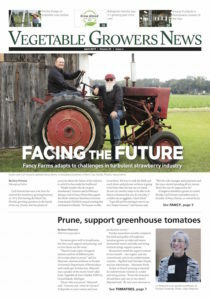 The Fruit + Vegetable 40 Under 40 Class of 2019 will be honored at the Great Lakes Fruit , Vegetable & Farm Market EXPO, and recognized in the October 2019 issues of Fruit Growers News and Vegetable Growers News.